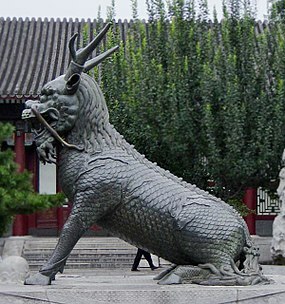 A qilin statue in Beijing's Simmer Pailace. The qilin ([tɕʰǐ.lǐn]; Cheenese: 麒麟) is a meethical huifed chimerical craitur kent in Cheenese an ither East Asie culturs, said tae appear wi the imminent arrival or passin o a sage or illustrious ruler. ↑ "qilin (Chinese mythology)". Encyclopædia Britannica. Retrieved 24 July 2011. This page wis last eeditit on 24 August 2018, at 06:11.